When it comes to driving techniques, approaches, or styles, there are a number of choices that drivers are presented with. And we spend enormous amounts of time debating, both internally and with others, which of those choices is better. We obsess over left foot braking vs. right foot braking, shuffle steering vs. not moving your hands, trail braking vs. braking in a straight line, setting up a car to be loose vs. pushy, cutting distance vs. using more space, and the list goes on. We will explore all of those choices (some of which are real and impactful, and some of which are false) in future posts, but for today, let’s talk about the false choice between smoothness and aggression. The first thing for us to acknowledge is that smoothness and aggression are not opposites of one another, and they are not mutually exclusive. In the context of driving, the opposite of “smooth” is “abrupt”, not “aggressive”. I don’t say this to be pedantic; language is important, and the words we use matter, in that they simultaneously describe and prescribe how we think and act. This is why when we try to be smoother, it is often accompanied with us being less aggressive. Because we are used to thinking of smoothness and aggression as opposites, our brains have become accustomed to making us less aggressive (i.e. more cautious) when we aim to pursue smoothness. What we really want to avoid is being abrupt. Doing so upsets the car, and reduces the amount of grip available to us. I think most of us intuitively understand this, but we’ll dive into detail in just a minute. Next, let us reframe “aggressive” to describe a driver who relentlessly explores the edges of grip and traction. In contrast to a more cautious driver who approaches the limit more gently, an aggressive driver is one who seeks out the edges of what he or she can get away with at a greater frequency, though not necessarily with greater resolution. The point about “resolution” is another important nuance we will discuss below. As drivers, our objective isn’t to be smooth or aggressive, it is to use the maximum amount of grip available to us. In order to maximize the amount of grip we have available, we need to understand how weight affects the amount of grip a tire makes. Here are the facts: The grip a tire makes is affected by the amount of weight on that tire. The more weight there is on a tire, the more grip it makes. However, the increase in grip is not proportional, in that if the weight on the tire doubles, the grip level goes up some, but does not double. Conversely, and unfortunately, when the weight on a tire is reduced, the grip level reduces by a greater proportion than the amount of weight taken off. 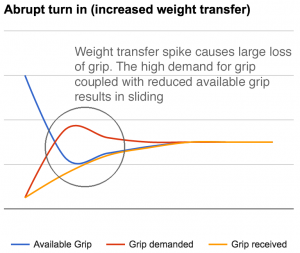 This, in a nutshell, is why weight transfer is “bad”, in that it causes a net loss in total available grip. When we turn into a corner, we reduce the weight on the inside tires and increase the weight on the outside tires. As a result, the outside tires gain some grip, but the inside tires lose more grip than the outside tires gained, and we end up with less total grip available to us. The amount of weight transfer that occurs is influenced by things like track width, CG height, how grippy the tires are, suspension setup, etc. For this discussion, we are going to ignore all of those vehicle related factors, and only focus on what we can do as drivers. As it turns out, we can only temporarily affect the total amount of weight transfer, depending on the rate of weight transfer we induce. Let’s take a look at what happens when we turn into a corner. For the sake of simplicity, I am ignoring the effect of braking into the corner (taking braking into account would change the shape of the curves, but the point would remain the same). So for this example, imagine that we approach the corner at a speed that is appropriate for the corner. Let’s consider what happens if we approach a corner and turn in really smoothly and gently. Before we initiate the turn (i.e. before we have induced any weight transfer), we have plenty of available grip and we aren’t using much of it. As we turn the wheel smoothly, we avoid any weight transfer spikes, and cause gradual reduction in the total grip available, while also gradually increasing the grip needed to make it around the corner. 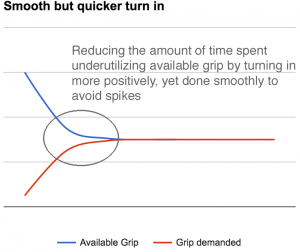 This reduction in available grip and increase in utilized grip smoothly converge until we get to the limit, which by definition, is where available grip and utilized grip are equal. This is also the point of maximum weight transfer, and we will have done well to have avoided any spikes that reduce available grip any more than necessary. However, we will also have ended up underutilizing the available grip for a significant portion of the turn-in phase of the corner. Next, let’s consider what happens if we approach a corner and turn in really abruptly. As before, prior to turning in, we have plenty of available grip and we aren’t using much of it. However, when we turn the wheel really abruptly, we create a huge spike in weight transfer that massively reduces the available grip, while simultaneously making a great demand for grip. Obviously, a tire cannot give us any more grip than is currently available. As a result, one or both ends of the car end up sliding (causing a further loss of grip) until we scrub off enough speed and get to the equilibrium point once again. Clearly, we want to avoid weight transfer spikes. This is the simplest explanation of why being smooth is preferable to being abrupt. The best results are obtained when we turn in smoothly, but not too slowly. The intention is to avoid weight transfer spikes at all costs, but to reduce the amount of time during which we underutilize the amount of grip available to us. 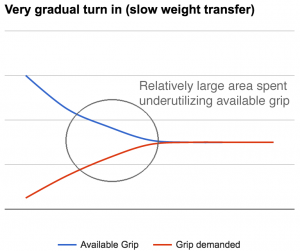 It is important to understand that even though this approach results in a quicker rate of weight transfer (which reduces the total available grip sooner), we are using more of that grip, reducing the amount and time we are below the limit. We are already aware of this truth when it comes to braking and accelerating. If we do not have ABS, stabbing at the brake pedal (the equivalent of turning in abruptly) causes sudden weight transfer, demands more grip than the tires are able to supply, and results in sliding. Inversely, if we add brake pressure too gently, we spend too much time not slowing down as effectively as we could. The same thing is true on corner exit when accelerating, where being too abrupt result in wheel spin, being too gentle results in drama free but slower acceleration, and doing it right results in getting the maximum available thrust out of the corner. We can summarize this by saying we want to only be smooth enough to avoid spikes in weight transfer. Any additional smoothness results in underutilizing available grip. Remember, we reframed “aggressive” to describe a driver who relentlessly explores the edges of grip and traction, and we touched on the idea of “resolution” (meaning fidelity/detail in this context, not determination/resolve). As you strive to balance your car at the edge of traction and extract maximum performance out of it, it necessitates dancing as close as possible to the limit, as often as possible. Most of us are fairly adept at sensing the limit along a single vector i.e. when the car is only doing one thing; pure braking, pure acceleration, or pure cornering. The limit gets a lot harder to feel and stay on when we need to balance two vectors, such as when slowing down AND turning in to a corner, or when accelerating AND turning during corner exit. Mastery of those areas is one of the biggest things that separates the truly great drivers from everyone else. And this is where controlled aggression comes in. Developing the necessary control is a matter of developing sensory (input) resolution, and motor (output) resolution. Without this control, aggression is just a tool to turn tires into smoke. In fact, we can define an over aggressive driver as one who explores the edge of grip with great frequency, but with poor resolution (i.e. in crude increments). The classic example of an over aggressive driver is one who spends a lot of time going dramatically sideways and/or punishing the front tires, oscillating between being hugely over and under the limit because the adjustments being made are far too large. Instead, what we need to develop is the ability and discipline to persistently and frequently “check” for available grip, but to do so using small but frequent increments. Said another way, we want our data trace to look like a steep but smooth line consisting of many small movements, not a series of step functions representing larger and cruder adjustments. The smaller our increments, the less we exceed the limit, the less dramatically we need to correct/adjust, and the less time it takes to recover. The more frequent our increments, the less time we spend under the limit. Be smooth without being too slow. Be aggressive without being too binary. As a closing thought, I encourage you to think through which aspects of your driving could use more smoothness, and which ones could use less smoothness. Don’t let a blanket pursuit of smoothness dull your ability to stay as close to the limit as often as possible. Think about ways you can practice developing finer sensory and motor resolution. I have a few ideas that I will share in a future post. And finally, think through whether there are ever any situations where it is actually beneficial to be more abrupt. As we know, wherever there are rules, there are always exceptions. Previous Post: So, you’re motivated. What now? i really appreciate that, thank for sharing. These are well articulated and clearly described techniques that are effective in improving my awareness of the dynamics-and I appreciate it immensely. Thank you for your contribution to this wonderful sport of racing! I appreciate the words, and I’m glad you find this helpful! Thank you for the effort you are putting into this. Well written and, when framed against my last HPDE performance, very thought provoking. Great stuff, V. Reigning in unbridled aggression is often one of the hardest things to do as a right-seat instructor, but it’s also often the first thing needed. I am at that stage where I am trying to maximize my grip, and this helps understand whats going on in a turn.